Welcome to my independent review of the New Garmin Drive, the latest automotive GPS with added driver awareness features. Announced at CES in January 2016, the Garmin Drive series promises to be an excellent update and a significant step towards greater driver safety on increasingly busy highways. The Garmin Nuvi GPS range has been very successful with many devices to choose from. However, Garmin has decided to update and rebrand, changing the Nuvi name to Garmin Drive. The new Drive series does look impressive. Entry-level options include a wealth of new features (Drive Alerts, Free Lifetime Map Updates, Speed Camera Alerts, Lane Assist/Junction View and Points of Interest). Premium options include stylish metallic navigators with smartphone notifications and Traffic. One thing is clear, there is now a Garmin to suit your driving style. Garmin Drive: Easy-to-use GPS navigators that feature preloaded maps and innovative driver alerts. Garmin DriveSmart: Voice-activated navigation, driver alerts and onscreen smart notifications. Garmin DriveAssist: Built-in dash camera and driver alerts to encourage safer driving. Garmin Drive Luxe:Elegantly designed with sleek metal case and powered magnetic mount. Garmin has seen a decline in what was once an extremely profitable market for the global leader in satellite navigation. However the car navigation market still makes up to 50% of Garmin’s revenue. Garmin have seen growth in new markets such as wearable technology which has helped offset the decline (see Garmin Forerunner Range and Approach golf GPS range). Garmin remain continue to develop and build on their existing product ranges and compete with the likes of TomTom. Does Garmin still have the edge over Smartphone Apps? With mobile phones and navigation apps becoming ever more popular, is it still worth having a stand alone car GPS? We certainly think so. A dedicated car GPS offers so much more than a mobile phone. Large, clear displays, advanced guidance and navigation features greatly increase your awareness of the road ahead, making your journey safer and more efficient. Unpredictable situations on the roads, as well as distractions in the car, make driving a stressful experience daily. In recent studies, drivers admitted not being 100% focused on the road (73% change radio stations and 86% talk to the passengers next to them). Built with your safety in mind, the New Garmin Drive series is there to keep an extra eye on the road, 100% of the time, and sees the problems before you do. I expect the new Garmin Drive range will be some of the best selling GPS devices of 2016 and beyond. Garmin has considered every type of customer with their new range. Each model builds on the last with more features. However, the DriveLuxe is an exception to this rule as it unfortunately doesn’t have a built-in dash camera. Garmin Drive Luxe is the premium model in the range due to it’s beautiful metallic casing and sleek ‘snap-on’ magnetic powered mount. The Garmin Drive GPS Series does so much more than navigate you from point A to point B. With features designed to increase situational awareness and encourage safer driving, you can rely on a Garmin for every drive. 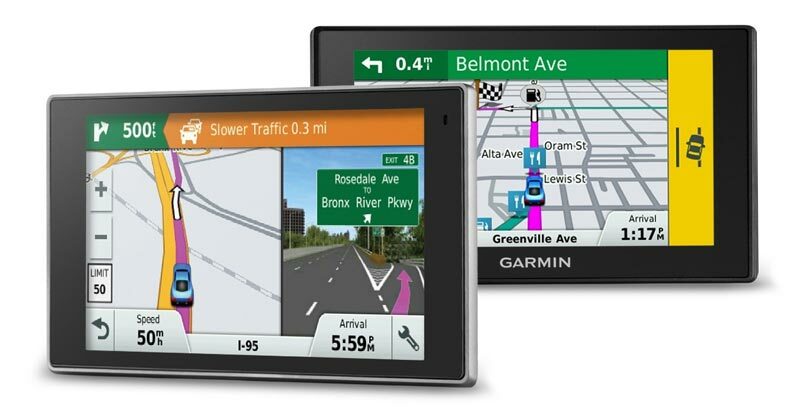 All of the Garmin Drive GPS have core features for essential and simple navigation. These features offer so much more than a free navigation app for your smartphone. New Driver Alerts notify you of upcoming obstacles including sharp curves in the road, changes to speed limits, school crossings and more importantly red light and speed cameras.You can see places up ahead and milestones along your route, without leaving the map view with New Up Ahead Milestones. You can use Garmin for points of interest on your journey, and can tap into Foursquare to find the best places to eat, drink, shop, or visit. The turn-by-turn directions included are intelligent and easy to follow, directing you by recognizable landmarks, buildings and traffic lights up ahead. If you’re considering buying a new Garmin Drive GPS then look for the models with free lifetime maps and traffic included. 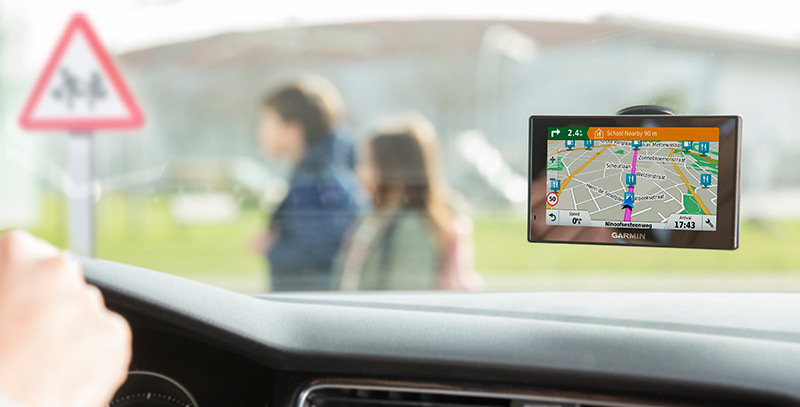 Garmin Drive ‘LM’ models will allow you to update your maps up to 4 times per year, or as soon as new maps become available. This will give you extra confidence on new journeys as your GPS will have the latest map updates. it’s important to keep your GPS updated as new roads are constantly being built. New Garmin map data also includes business addresses, points of interest, telephone numbers and contact details. Garmin Drive ‘LMT’ or ‘LMT-HD’ models have traffic included, giving minutes of delay and alternative routes available. Garmin offers up 3 versions of traffic alerts, so it’s important to recognise which version is best for your journey. 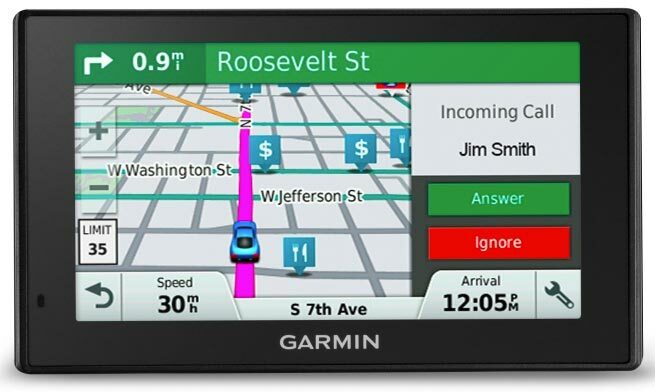 Garmin HD Digital Traffic (LMT-HD) is the fastest and best traffic system available, it’s updated about every 30 seconds. This version will give you the most up-to-date picture of the traffic ahead on your journey. Garmin Free Lifetime Traffic (LM) offers free traffic information for the life of your device with no annual subscriptions, and is updated every 5 minutes directly to the GPS. Garmin Free Lifetime Traffic works by using your connected Bluetooth smartphone and the Garmin Smartphone Link App (Android or iPhone). You will also receive weather alerts and other useful ‘live’ information on your journey. Garmin have been adding smartphone notifications to all of their GPS devices. We have seen them on wearables such as Garmin Forerunner running watches and the Approach S20 golf GPS watch. When a Bluetooth smartphone is connected to the Drive GPS it will display call and text information so the driver can keep their hands safely on the wheel. Other alerts include social media and app notifications. If you are distracted by your phone when driving then this will be an important selling point, one glance at the Drive display and you’ll know if it’s an important alert, without stopping to use your phone. The Garmin DriveSmart has some of the most advanced features of the range with Bluetooth hands-free calls, voice-activated navigation, and onscreen smart notifications (calls, texts and other app alerts) to encourage safer driving. It’s available as 5inch, 6inch or a whopping 7inch pinch-to-zoom display. DriveSmart alerts you to approaching traffic jams, dangerous curves, speed zone changes or railroad crossings. Plus, a fatigue warning even suggests a break after hours of driving, identifying potential rest areas ahead. The Garmin Drive Assist is essentially a smaller version of the best selling Garmin NuviCam, launched in 2015 (5inch screen in comparison to 6inch). Drive Assist comes with advanced driver awareness features to encourage safer driving. Garmin Drive Assist records your drive with it’s built-in dash camera, automatically saving collision footage on impact. You can also receive “go” alerts when you’re stopped, and the car in front starts to move. Other features include Forward Collision and Lane Departure Warnings, camera-aided Garage Park Assist, Bluetooth hands-free calling, voice-activated navigation, lifetime map updates, free lifetime traffic and much more. The Garmin Real Vision feature also displays a camera view when approaching select destinations for pinpoint navigation to your final destination. At the top end of the range is the Garmin DriveLuxe, an elegantly designed, 5-inch premium GPS with advanced navigation features. Most impressive of all is the magnetic powered mount which gives the ‘snap on’ effect for easy removal from your windshield. Navigation features include free lifetime map updates and free Digital Traffic alerts. Drivers will also be notified of approaching dangerous curves in the road, speed changes, red light/speed cameras or upcoming traffic jams. Garmin has strengthened it’s position albeit in a declining market. However I feel there is still a need for a dedicated car GPS. The Garmin Drive Series offers so much more compared to what a smartphone app can deliver. Every driving style and budget has been accounted for.Drivers on a budget have the entry level Garmin Drive which still offers the new driver awareness features. Daily commuters may find the Garmin DriveAssist more practical, especially in the event of a road traffic accident. Professionals looking for a premium device will prefer the Garmin DriveLuxe, with it’s forged metal casing and responsive, capacitive touchscreen display. Smartphone notifications are certainly useful, as are hands-free calls and voice activated navigation, so you can keep your hands safely on the wheel at all times.